When Kenshin is content and in his normal, day-to-day state, his eyes are purple. 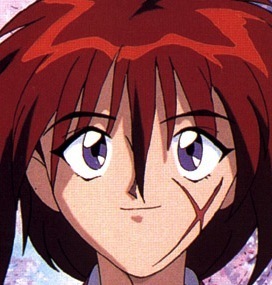 Kenshin's eyes, too, are unusual, being a deep violet. 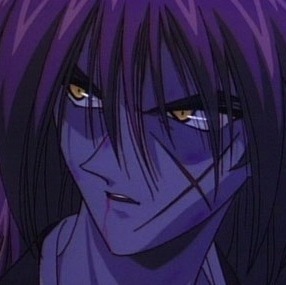 In the anime series, when Kenshin's eyes change to reflect his psychological reversion to Hitokiri Battōsai, their color shifts from violet to gold. It's just artistic style especially used in the earlier days of manga/anime to show a different, more serious state rather than the character's usual jovial self. Many animes did this before the millennia and everyone just sort of accepted it. As they evolved fewer Anime's do this now except the ones aiming to parody earlier works. I personally prefer this to when he would glow red in Season 1 to show his angry state. What didn't make even more sense was he went into the glowing state in the Requiem movie which takes place after he learned Amakakeru ryu no hirameki (which was supposed to suppress his hitokiri side since he came to terms with it). It isn't a split personality, something which we now believe doesn't exist and isn't used as a diagnosis anymore. I believe that his eyes change color for artistic/symbolic effect. His soul is fractured so he must shed parts of himself in order to become a better fighter. When he is truly in danger he reverts back to the man slayer, a killer above all others. After he finishes his training with his master his soul is mostly at peace and he doesn't need to bury himself to become stronger and can thus reach a higher potential then he ever could as a man slayer. "It's said that eyes are the window to the soul, and in fiction, their color is often the first way to hint at a character's true nature. In particular, characters who have gold and yellow-colored eyes tend to have some form of supernatural origin or powers that place them above normal humans." We realized it is more cause Kenshin has a Split personality. When he is forced to get serious in a battle and loses himself to it his personality changes. The prime example is when he was fighting an old rival from the war after Sanoske got hurt. He punched himself in the face to bring his kinder much gentler self out. When his eyes change. You know his other personality has emerged.